FREE Shipping Everyday - No Minimum! You may have asked yourself, what is a distributor for a car or truck? The main function of a distributor on a car is to “distribute” electrical current from the ignition coil to the spark plugs in the correct time and order causing the combustion process in the cylinder. High voltage from the ignition coil is connected to the rotor. The rotor has a contact on it and spins inside of the distributor cap. As it spins it transfers high voltage between the rotor and the corresponding contacts on the cap (each cap contact representing a cylinder). 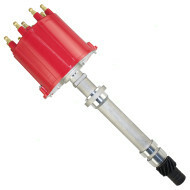 The distributor in a car can eventually go bad with normal wear and tear. As with most parts involved in the ignition process of a vehicle, the symptoms of a faulty cap, rotor, and distributor can vary. Anything from a car not starting or running poorly to a squealing noise and a check engine light are all possibilities. Due to the high amount of voltage constantly being transferred through the distributor, carbon build up or burnt contacts can occur. Therefore, most mechanics will recommend replacing distributor caps and rotors every 15,000 miles or two years for optimal vehicle performance. Whether you are looking for quality at a great price on a distributor cap and rotor kit or the whole distributor, Everyday Auto Parts has you covered. Sign up to receive our e-mail newsletter! We promise to deliver the best quality aftermarket replacement auto parts at an unbeatable value. Your satisfaction is 100% guaranteed with Everyday Auto Parts®. All auto parts purchased from us are covered by our 1-Year Limited Parts Warranty and are guaranteed to fit and perform without any problems.